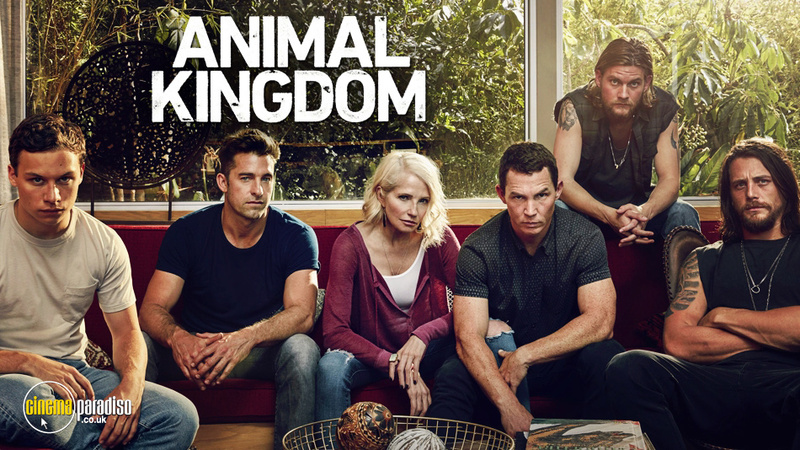 Animal Kingdom is an American crime/drama TV series starring Ellen Barkin, Finn Cole, Scott Speedman, Shawn Hatosy, Jake Weary, and Molly Gordon among other actors. The show is centered on Joshua “J” Cody (Cole), who starts living with his relatives in Southern California after his mother dies from a drug overdose. As he tries to adapt to this new lifestyle, things take a turn for the unexpected. Ellen Barkin, Scott Speedman, Shawn Hatosy, Kandis Mak, Ben Robson, Kai Pedersen, Melissa Blackwood, Jake Weary, Finn Cole, JB Warren, Molly Gordon, Daniella Alonso, Christopher M. Campos, Molly Gordon, Darin Cooper, Gil Birmingham, et al. When his mother dies of a heroin overdose, 17-year-old Joshua "J" Cody moves in with his estranged relatives in a Southern California beach town. Heading up their petty crime dynasty is J's manipulative grandmother, Janine "Smurf" Cody, whose ironfisted, velvet-gloved tough love controls her four sons: adopted right-hand man "Baz"; intense, mentally disturbed "Pope": tough, hyperactive Craig: and troubled "Baby" Deran. As J copes with losing his mum, aggressive rivalry between his uncles and a concerned high school teacher, his new family incites more danger, excitement and trouble than he's ever known. Emmy winner Ellen Barkin rules over a fiercely talented ensemble cast in all 10 episodes of this edgy, crime-fueled series based on the award-winning Australian film of the same name. Season Two explodes into action with the brash Cody bad boys in the midst of a high-adrenaline heist. But their haul is a dud, and the frustrated brothers rebel against their all-controlling mother, Smurf...as well as each other. An external threat from Smurf's past adds to the chaos, jeopardizing her position of power. As J graduates from high school, his grandmother presents him with an awesome gift...and ominous responsibility. By the 13th episode, one Cody will be in prison and another one left for dead. It's shocking what mind games, backstabbing and lies can do to a relatively normal Southern California crime family. Ellen Barkin captivates as the manipulative matriarch who specializes in hard-core family values and a love so tough it can kill. The Codys are back and the ties that bind them are about to be stretched to the limit as Animal Kingdom returns for season two. One of cable's Top 5 new dramas this past summer the series about a Southern California crime family stars winner Ellen Barkin as Smurf the matriarch of the Cody clan Scott Speedman as her second in command and Shawn Hatosy as her volatile mentally unstable eldest son. As the second season opens, the Cody clan is back to their old ways and in the midst of a fun, high-adrenaline heist. But when things don't go as planned, the family dynamics become more fractured than ever as some members advocate for independence from Smurf. Adding fuel to the fire is an external threat from Smurf's past that has come back to haunt her. The series also stars Ben Robson, Jake Weary, Finn Cole, Molly Gordon and Carolina Guerra.